Q) - What is the Quick Ship Section of sheaths? A) - These are knives that we stock, so that you do not have to send yours in. Most of the sheaths that we manufacture are for knives that customers send in to us. In an effort to make ordering more convenient, and more expedient for our customers, we stock popular models of current production knives in house, so that our customers do not have to send their knives in. This saves our customers both time, and money. 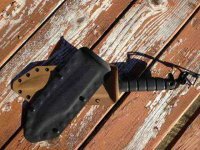 It also gets our customers their sheaths more quickly as we do not have to wait to receive the knife, in order to make its sheath. Normal production times still apply. Knives that we stock do change according to popularity, availability, and/or customer demand.